Falls from height are one of the biggest cause of death and serious injury in the workplace. All rooftops should be guarded by a fall protection system to ensure safe and efficient maintenance programmes. Help is at hand through global safety specialist - Kee Safety, who provides fall protection solutions that eliminate many of the unnecessary risks that are taken every day by people working at heights and complying fully with all relevant regulations. Fall protection can be achieved with the use of KEEGAURD guardrail system. Compatible with a range of roof membranes, including concrete, asphalt, PVC membrane, metal and felt, KEEGUARD offers a free-standing roof edge protection system capable of keeping workers on the roof safe without endangering the roof membrane itself. It does not penetrate the roof surface and can be used on flat roofs up to 10° slope. Employing a proven counterweight system, KEEGAURD combines a non-slip secure base with galvanised fittings and tube arranged in a modular configuration. Fully modular and versatile enough to adapt to most roof edge profiles and level changes, sections can be easily taken down and re-erected as necessary. KEEGUARD has been designed for optimum safety, the system complies fully with work at height regulations, including EN ISO 14122 Part 3 and EN 13374 Class A, and even allows for an integral kickboard fixing to further save time and cost on site. The recycled PVC base weights used with KEEGUARD bring a number of advantages, particularly making installation quicker and easier, thus saving time and money. Made from 100% recycled material, they provide an environmentally friendly alternative to conventional weights. 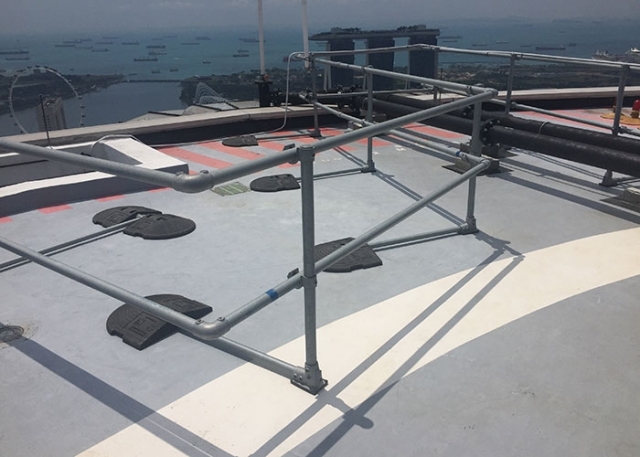 Kee Safety Singapore Division provided Asia’s largest Real Estate company, Capital Land, with its KEEGUARD flat roof protection system for installation on the Raffles City Tower, one of the tallest hotels in Singapore. 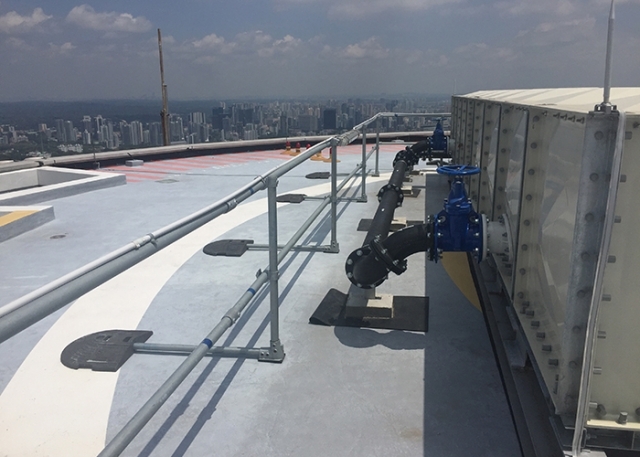 When main contractor, Gennal Industries was tasked to change the water tank in the building, they had to build a temporary one on the helipad on the top of the building – 73 stories up. Before work could be carried out, the contractor required a temporary guardrail system that would surround the perimeter of the tank. Gennal Industries contacted a local Kee Safety`s approved fall protection installer, who carried out a full site survey and recommended the installation of KEEGUARD collective fall protection. Work began on the project in November 2017 and was completed in less than three working days. More information bout KEEGUARD is available on the product page. You may also want to see more examples of KEEGUARD installation. Contact us with your project details today!